Další bandou pro OEF 2019 jsou nám dobře známí metaloví punkáči z jižního Německa, ACCION MUTANTE!!! Jejich muzika nám dává vzpomenout na nejlepší léta stylu britcore, za kterým si můžeme představit legendy stylu Doom, Extreme Noise Terror nebo Extinction of Mankind, které svou zběsilostí ACCION MUTANTE připomínají!!! Z crustové špíny a hnusu tito Germáni povstali v roce 1994, a letos to bude již potřetí, kdy nám po částečné hibernaci a regeneraci kapely, na prknech OEF znovu zahrají!!! From the darkest depths of South Germany, born screaming from the dirt in 1994, ACCION MUTANTE carved a unmistakable depression into burgeoning crust scene, during those dark early days of stench and filth. Sharing stages internationally with Doom, Extreme Noise Terror, Driller Killer, Ratos De Porao and Extinction of Mankind (to name but a few), ACCION MUTANTE let free their ugly beast of unique, awful, unrelentless ear bleeding noise. After a short period of hibernation, partial rehabilitation and regeneration, they are firmly back to prove they are not dead (yet). 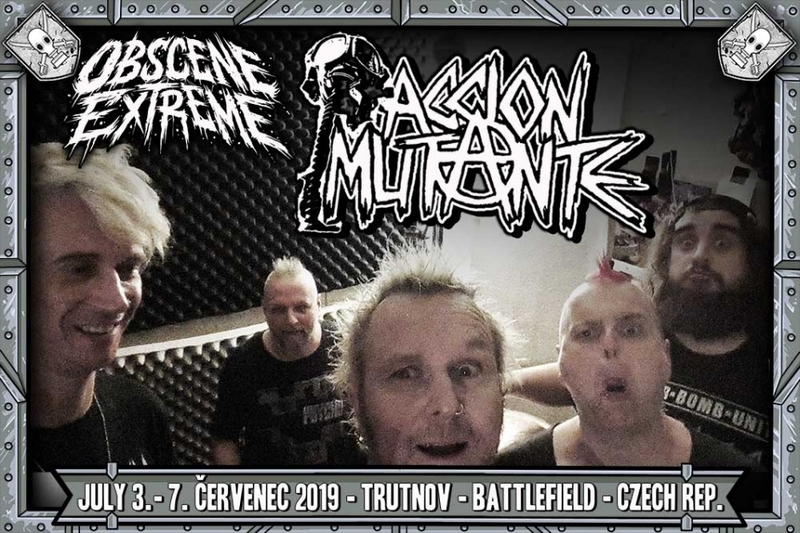 2019 sees the band celebrate 25 years of chaos, crust, dreads and spikes with a call to arms seeing them take aim for a third time at the battlefield in Trutnov.